Daniel Scioli, his former Health minister Alejandro Collia, and former Chief of Staff Alberto Pérez, stand accused of participating in illegal business operations tied to the construction of medical clinics in Buenos Aires province. Former Buenos Aires governor Daniel Scioli will stand trial on charges of having received bribes in exchange for public works contracts. 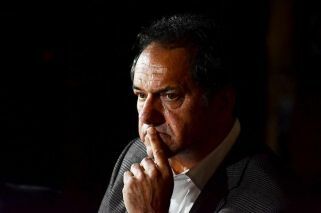 Scioli, his former Health minister Alejandro Collia, and former Chief of Staff Alberto Pérez, stand accused of participating in illegal business operations tied to the construction of medical clinics. The clinics formed part of a public works plan known as Rapid Attention Units (UPA). Prosecutor Álvaro Garganta alleges the men were pressured with bribes to grant construction contracts to the firm Miller Building S.A. The initial criminal complaint was lodged by lawmaker Elisa Carrió and includes the firm's owner Ricardo Estanislao Miller. In his presentation to the courts, Garganta said the operations were made possible by the "personal and commercial relationship that the governor (Scioli) had with the president and majority shareholding [of Miller Building], as well as resulting from gifts the governor received from him for his role" in facilitating the granting of contracts to Miller. In May, Scioli was slammed with a AR$ 189 million (US$ 5.2 million) embargo on his assets and was banned from leaving the country. He currently sits as a lawmaker in the national Lower House, where parliamentary immunity protects him from jail time but not prosecution. On Wednesday, Scioli was seen on stage at the October 17- Peronist "Loyalty Day" celebrations in Tucumán alongside presidential hopefuls including Sergio Massa and Miguel Angel Pichetto.